We arrived at the hospital a little before midnight. After waiting in the blasted emergency room for about 15 minutes, they took us up to maternity triage. Laboring in that tiny curtained area on what was basically a stretcher was insane, to put it mildly. Definitely couldn't walk around to cope with the pain. The contractions were hitting me every 1-2 minutes and I had to moan through them -- couldn't control it. Dill put counterpressure on my back and hips which helped some. We were watching the contractions on the contract-o-meter-majiggy (I don't know what that's called) and they were all off the chart. All the while I was thinking, Where the heck is the nurse?! I need an antibiotic! I tested positive for Group B strep and I wanted to make sure I got a dose in before the baby came. Eventually, Paula the nurse came in and got that IV started. It took 30 minutes for the drug to be administered, so about 20 contractions later I was finally able to get into a delivery room. By this point, I didn't care what I sounded like -- I had to get through those brutal contractions and deep breathing wasn't cutting it. I'm pretty sure I was scaring the other people in triage with my wounded cow noises. It was sometime between 1:00 and 1:30 AM when we got into the room. It was very spacious and nice. My midwife, Melissa was there. I basically hopped on the bed and then decided, nope, I've sat on a bed long enough, I need a new position to labor in. So I asked for the birthing ball and they rolled it in. It looked huge and I didn't think I could easily climb up there. Mind you, as a VBAC patient, I had to be continuously monitored, so I had all these dumb cords hanging off me. But Paula and Melissa were great about helping me maneuver around them however I needed to. I sat on the ball for a long time and the contractions continued to get much harder. With each one, it was like a wave rolling in. I could feel it as if it were off in the distance, and as it got closer, I braced myself the best I could for what was to come. I tried not to fight the pain but it got more and more difficult not to as things progressed. Eventually, while on the ball, I felt this immense pressure and I surrendered to it -- that's when my water broke. I gingerly climbed back on the bed to be checked. I was at 8 1/2 centimeters. But now, the contractions weren't just painful but also causing lots of pressure. Like, baby's-head-is-emerging-please-help-me pressure. Paula raised the head of the bed for me. I knelt to face it while draping my arms over it and rested my head at the top. She and Melissa cautioned me not to push because I could really damage my cervix. Well, it seriously took everything in me not to push. The feeling was so overwhelming, I started to get scared and hyperventilate. Paula slapped an oxygen mask on my face and they called the doctor. Dr. Guzman came in and basically gave me some tough love. He was in "game on" mode -- stern but calm. He told me I needed to breathe deeply because I was stressing my baby out. "This is what you wanted, isn't it?" I nodded a little regretfully. No epidural? Yeah, I did actually want that. But my body freaking out and trying to eject the baby before it was ready? Not even a little. I did NOT want that! Dill was the greatest support I could have asked for. He did whatever I needed -- brought me water to sip through a straw, rubbed my back and arms, stroked my head, talked me through it all ... he was just what I needed to get through it. True to his nature, he stayed calm through it all. A few times I looked him in the eyes and said, "I can't do this ... it's too much to bear!" He'd just quietly remind me that I could do it and was doing it and to simply focus on each contraction. He reminded me to breathe low and steady to keep the oxygen flowing. It was still incredibly difficult, but I knew I could do it as long as he was with me. When things got really hard, I had to go deep within myself to find the courage to go on. I imagined my foremothers pushing their babies out without anesthesia. I envisioned Mary and Eve laboring outdoors. I thought of the Savior suffering these very same pains in Gethsemane. And oh my, was her head ever born! It hurt like crazy upon exit and a whole lot of amniotic fluid gushed out along with it. One more push and her body slithered out, too. I'd done it. I'd given birth and felt every single part of it. Except, I was still feeling it. And by "it," I mean a whole lot of pain and burning. Not the euphoric cocktail of oxytocin and love hormones that you're supposed to get. Not even close. Another nurse put my newborn daughter on my chest and began drying her with a towel. Oh, she was precious! All three times I've given birth, I've been amazed at how small the baby is when I first get to hold them. My belly always gets so huge by the end, I'm expecting a 15-pound toddler to plop into my arms. But no, it's just this tiny, slimy, wailing creature roughly the size of a Dachshund. It's crazy, really. I was excited to meet Clara finally but also, something wasn't sitting right. I felt sick, to put it mildly. More accurately, I was in a lot of pain still and had begun trembling in agony. Melissa made a discreet comment about needing another pair of hands in sterile gloves to help stitch me up. My stomach sank ... NO! I asked the question I already knew the answer to and Melissa confirmed I had indeed tore, just in the opposite direction from last time. Yeah, wow. Not the news I wanted to hear. Apparently, I had so much rigid scar tissue from Carson's birth that I couldn't tear in that direction this time. I got a tiny fissure there, but the main damage was done on the front end. Her head came out so fast ... it was inevitable. Dill cut the cord shortly thereafter and then I had to push out the placenta. I somehow managed, knowing that the repair had to be made and that couldn't happen until the placenta was out. 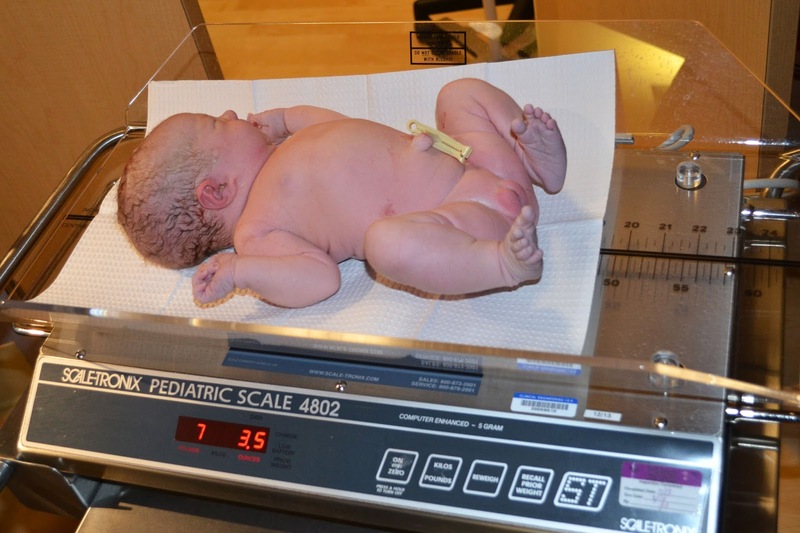 They weighed Clara -- a healthy 7 pounds, 3.5 ounces. Then, Paula put some Stadol in my IV line and I kind of passed out. I could still carry on a conversation and feel the stitching, but I felt very tired and "out of it." It took an hour to complete the repair. I felt like I was in a dream the whole time and that I would soon wake up in my bedroom, still pregnant. But then, I would open my eyes and see I was still in the delivery room. I was so scared to face the recovery from this tear. I knew I didn't have long before the pain medication would wear off and I'd feel the acute pain from the injury. I was terrified. In a haze, I lamented to Melissa that avoiding a tear was THE reason I didn't want an epidural. She was very kind and understanding as midwives usually are. She had done everything to help me avoid it, but that last horrible delivery came back to haunt me yet again. As she reminded me, "Sometimes these things just happen." After the stitching, I got to nurse Clara. She latched on well and it was so sweet to bond with her. I felt so blessed to have a perfectly healthy, happy baby in the aftermath of such a crazy birth. I had a feeling in that moment that she would be a peaceful, calming influence in our family. So far, she has been just that. She rarely cries and practically came out of the womb on a feeding schedule. She nurses well, sleeps long stretches at night and she's just happy to be alive. Everyone loves her. I am so grateful she is the one to complete our family. I have processed a lot of feelings since Clara was born -- anger, pain, sadness and grief at not having the type of birth I wanted. I didn't expect it to be easy; in fact, I expected it to be exquisitely hard with the hope that my recovery would be infinitely easier this time. Everything I'd read and studied supported this belief. But I managed to defy those statistics. I also felt regret -- for not getting an epidural, for taking the castor oil, for not taking a childbirth class. Maybe this was all my fault. Maybe I deserved it. It's now been two weeks since the birth and things still hurt. I am healing, but it's a slow process. I still ponder on what I went through that day and how now, I not only carry the emotional and physical trauma of Carson's birth, but also some from Clara's, too. I hoped that I would have a gentle birth experience to erase my past trauma and subsequent pessimistic feelings on the matter. But I didn't, so those feelings remain. I'm trying so hard to come to grips with it. I hope in time I will. Through it all, I still believe midwifery is the way to go if you want to have your best birth possible. I wouldn't have chosen any other way. Every step of the pregnancy, I was guided by the most caring, kind women in all my decisions. They supported me fully and encouraged me continually. They really do want what's best for you from start to finish. And when things don't go as planned, they are there for you to comfort and help you heal. So, I want thank you to my wonderful midwives and OB -- Melissa Troncale, Ramona Joseph, Tiffany Jackson and Grayson Guzman, whom I now consider my friends. They're the best birth advocates out there! 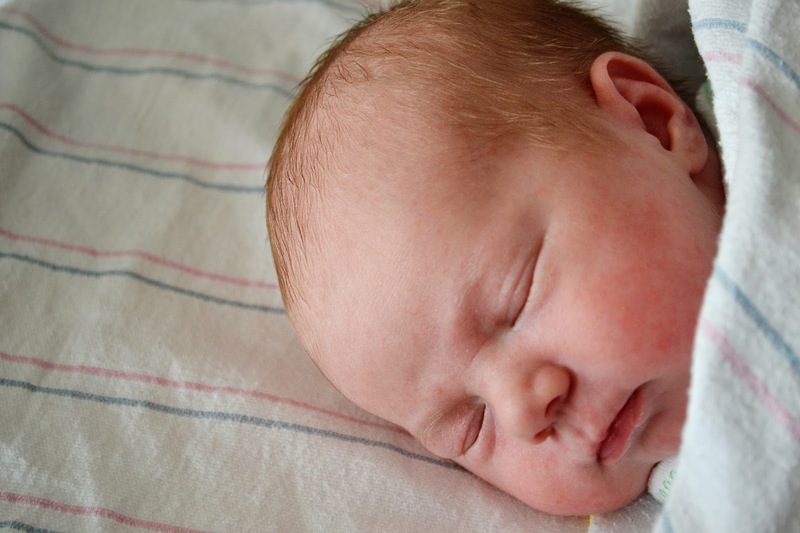 I'll leave you with a shot of Clara from our last day in the hospital. She's simply precious and we love her to pieces. Girl you are my hero! I'm sorry it didn't go as planned :( But she is gorgeous and I hope you recover quickly! I feel the same as you about my most recent birth experience. I wanted the whole natural experience... midwife. laboring in water, no IVs.. (I too had gbs + results with my delivery 2.5 years ago) I also wanted the whole "new baby oxy high" with delayed cord clamping and weighing so i could just sit and hold my baby..my Labor went really smoothly until the very end... and then he got stuck (shoulder dystocia) and every plan went out the window and was replaced with a nurse climbing on top of me to push him down while my midwife pulled him out, blue and limp. He was only on my chest for about 2 seconds before he was hauled to the cart and about 6 nurses rushed in to help. Instead of the peaceful first moments I had planned, his first minutes of life were full of fear and anxiety. Just like you i blamed myself. i kept asking myself if my decision to have my water broken to get my contractions more consistent caused the dystocia. In the end I guess you just have to accept the outcome "as is" and move on knowing the ultimate goal of having a healthy baby is all that really matters. I relate to your birth story with my birth stories. I am sorry in the end your recovery wasn't better without the epidural, and just like in my experience, there was no high for me giving birth naturally. It was just a lot of pain and it was done and she was here thankfully healthy. (It took me about two years to get over that labor experience) My last labor was less traumatic than my second labor though, and my recovery was better, but still no high, just grateful labor was over. I'm so glad she's here though and healthy and she's darling! Congratulations! Got teary reading this as Melissa delivered my sweet Audrey at Mercy Gilbert last June. I completely can relate to the pain and the tearing, because I tore the other way as well and it was HARD. Love Mom Doc Midwives so so much!! Congrats on your sweet Clara! I must say though... WOW! I admire you so much, you did amazing, AMAZING! Good for you for going without an epidural. My favorite part was how you mentioned picturing the mother's before us who had been through the same thing! I cried happy tears when you finally delivered Clara, without meds and just as planned, but I am so heart broken that you have to go through a painful recovery and emotional trauma all over again. So, so hard and sad. I'm sorry. Enoch's unintentional unmedicate birth took me three years to reconsile, but now I'm so glad it happened. I doubt you'll ever be glad for your trauma, but hopefully you can find peace. Sending my love. Wow, that was an intense birth story! As always I love your writing style. I'm sorry about your tear and difficult feelings. It's so hard to have it go not as planned and to have negative thoughts towards it. I was that way about Hannah's birth. I second Katie that you should just take it easy. Hoping things are better now as a few weeks have passed since this post. Congratulations on your perfect little baby!